Having 3 sons and a husband who is a good sport, I like to make unique costumes for our little group!! 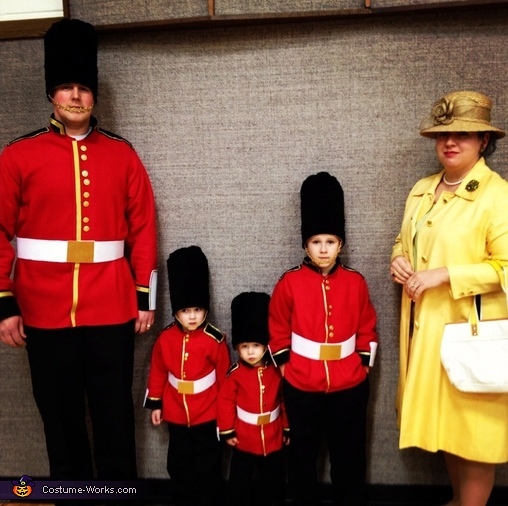 This year we decided to be The Queen of England and her Royal Guards. The Queens outfit was simple to put together by raiding my Moms closet, but thrift store finds would do the trick. As for the Guards I had to whip out the sewing machine as all my guys needed matching red jackets. I am not an expert seamstress so I I basically sewed a vest with plenty of room to over lap in the front to hide the velcro closure, and then put on sleeves. I made them out of fleece since there would be no need to hem them and we live in a cold climate so extra warmth is good. I then adorned the jacket via heat and bond or hot glue and put on lots of decoration, including gold buttons. For the hats I made a cardboard tube and then criss crossed cardboard at the top and hot glued fur over it . I added a gold strap with a velcro closure. Pair this with black pant and shoes and your done! Wow! Glad you have such cute guards! Adorable......the best family costume ever. Awesome costume, one of the best! My school is doing a parade of nations. We have England so I have 12 students being royal guards. Good work and great ideas.